Hi. I'm Annik from Mini Mushrooms. 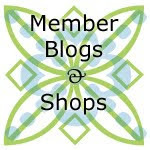 Today I'm here to give you a little recap of the Scrap Management class our guild offered on Saturday, February 8th, with Amanda Jean Nyberg, co-author of Sunday Morning Quilts and blogger at Crazy Mom Quilts. 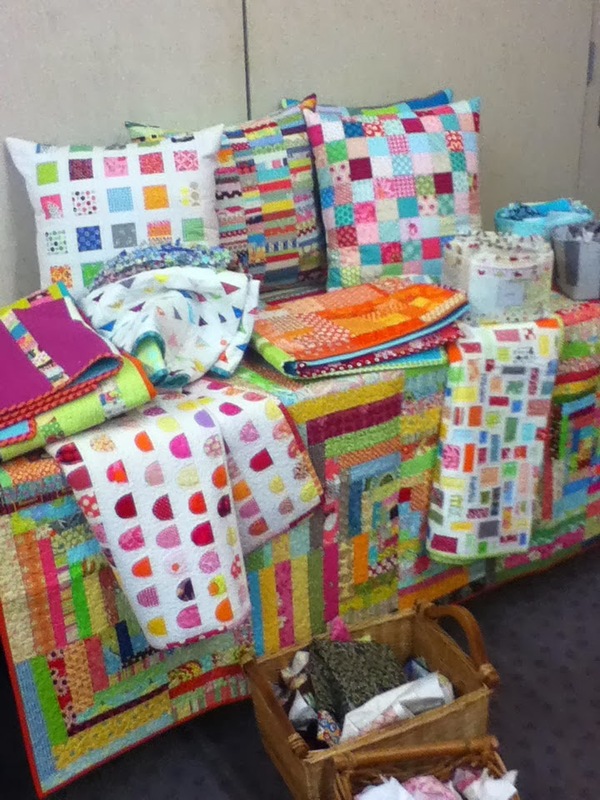 Amanda Jean greeted us with a table full of scrappy inspirations - quilts and projects from her book and more. Her show and tell session had us all oohing and aahing and completely inspired to start sewing. She walked us through the basics of organizing our scraps. Amanda Jean suggested keeping a bin or basket near our cutting area and throwing scraps in as we go. When the bin gets full it's time to sort the scraps by color. Each color should have its own bin, preferable a cute scrappy fabric box like the ones featured in Sunday Morning Quilts. Next up, a demonstration on slab construction. It's similar to log cabin block design but more spontaneous. 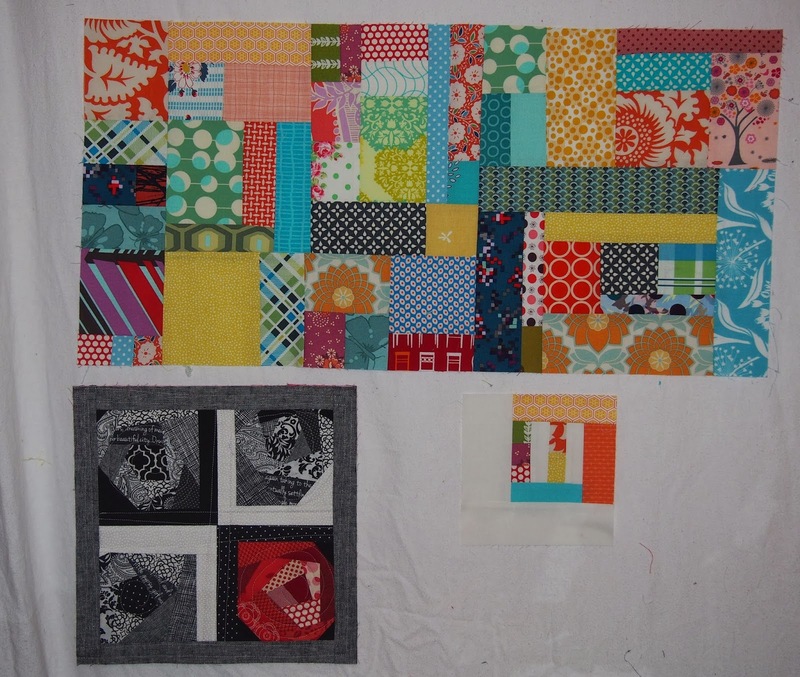 Simply sew those squares and rectangles together. Gina's making a dog bed. Lucky pooch! Once the instructional portion of the class was finished it was time for us to get down to business. We started by sorting the scraps we brought with us. Tables were covered with piles of beautiful prints. It was quite a sight. After sorting came sewing. Amanda Jean met individually with each class participant so we could discuss our plans and she, in return, gave us advice and encouragement. It was like having our very own Tim Gunn in the workroom! Organize your scraps. You're more likely to tackle a scrappy project when your fabrics are sorted than when confronted with a giant mountain of scraps. Cut up odd-shaped or large scraps into more manageable squares and rectangles (see first bullet point). Don't over think it. Start sewing and see where the project takes you. Trade scraps with others. Even when you think you have tons of scraps, you may be lacking in variety. Swapping is a good remedy and a chance to break out of your color/print comfort zone. Cut scraps into small pieces. Smaller pieces create the illusion of more variety. Start small. Bags, fabric boxes, and pillows are a great ways to use up scraps quickly. Ellen's soft, pretty monochromatic blocks. Most of us made slab construction blocks, often monochromatic or by a certain color scheme. Some folks sewed an amazing number of blocks while others were slow and calculating. At the end of the day we shared our progress and insights. It was a treat to see what everybody made. Using up my Japanese fabric scraps. A huge thanks to Amanda Jean for a teaching such a fun and informative class. And thank you to the Minneapolis Modern Quilt Guild for making it all possible. Jan's sophisticated black and white blocks.